Do you have students in your class with back problems, knee problems? Have you wondered how to work with commonly encountered musculo-skeletal issues in your teaching? Have you seen the powerful healing capacity of a careful and judicious yoga practice? Do you want to take your yoga knowledge deeper and to another level? Bodhiyoga offers a 500 hours training, open to any 200 hour trained teacher, forming part of your Continuing Professional Development (CPD) as a yoga teacher. Through the combination of practices and theoretical frameworks we offer a comprehensive and detailed multi-dimensional 500 hours training. If you are serious about training with us we offer a 45 minute video call (Zoom, Skype, Facetime) to talk over any questions and details regards our training. Ideally you would attend a workshop or retreat with us before the teacher training to get to know us and how we teach. Supporting these themes are the retreat-like conditions. We meditate and do the yoga sequences everyday before breakfast and conclude the day with meditation, readings and poetry. We ask existing 200 hour yoga teachers to do some preparatory study and begin to keep a working diary of their meditation practice. 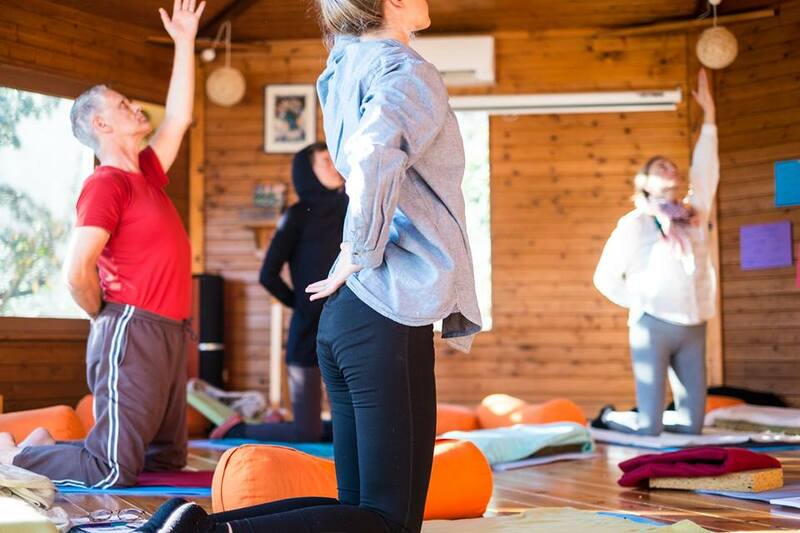 Students combine the week long Advanced training with a week long yoga and meditation retreat. Some home study and preparation make up the required hours to Certify for 500 hours. The full programme is designed to show existing yoga teachers how to apply mindfulness yoga to deal with specific musculo-skeletal issues. More broadly we show how to work with pain, stress and adversity in our own experience and others'. We also show how to integrate meditation and mindfulness teachings into yoga teaching practice. Each day there is an extended period of meditation and yoga practice led alternately by Sudaka and Sadhita before breakfast. Over six sessions we carefully analyse and look at the application of the remedial or therapeutic yoga sequences to work with common problems and conditions encountered in your students. We explore low back and upper back, hips and shoulders, knees and neck issues. This enables you to work safely, help your students rebuild strength and stability in their bodies as well as design more intelligent classes. Through three afternoon workshops we explore how to apply Mindfulness to yoga. We do this through Mindfulness practices, teaching and use of languange of how to concretely employ Mindfulness in yoga. We recognise that yoga and Mindfulness relate to separate though related spiritual lineages and show how to relate them in our yoga posture work. We rely on the Buddhist Satipatthana teachings to do this. We further our understanding of yoga and mindfulness to work with pain, stress and difficult situations. We have carefully adapted and designed the eight yoga asana sequences to be applied to six commonly encountered musculo-skeletal problems that you will typically find in your yoga classes. Using yoga, mindfulness and meditation as tools, we learn how to alleviate the physical and emotional issues related to these common conditions. On a deeper level, we learn to transform our mind and therefore see our suffering, in or out of yoga, as a way of understanding ourselves, coming to terms with the existential situation as human beings. Our training offers a practical vehicle for spiritual transformation. We are principally concerned in providing conditions for the development and deepening of greater awareness, confidence and self-discovery.The 500 hours CPD training is based around the Satipatthana (Mindfulness) teachings of the Buddha. During the course, we delve more deeply into this subject both practically, experimentally and theoretically. The core elements of the 500 hours Advanced Bodhiyoga teacher training; yoga, remedially applied, and Mindfulness and meditation are our response to these essential questions. We bear in mind that we are trying to take our students towards a greater understanding of life and of themselves and not merely aim to alleviate immediate symptoms of pain or discomfort. The Buddha's teaching on suffering (or dukkha) reminds us that suffering is an intrinsic part of the human condition. There is no question of having a human body without at some time or other experiencing pain or discomfort. How we approach dealing with this pain and discomfort makes all the difference. We have the opportunity to grow through waking up more fully to our expeirence just as it is. Here we learn to take what is before us as an opportunity to grow and develop. This approach to practice could be called, “Taking adversity as the path”. This is the retreat centre associated with the Valencia Buddhist Centre, a space dedicated exclusively to meditation and Dharma practice. A country house up in the hills some 60 km to the North West of Valencia. It is situated in a delightfully hidden valley, surrounded by arable olive and almond trees as well as pine and oak woodlands. Much love and care goes into creating an ideal place to practice. Write to us to make a payment to Bodhiyoga. Please contact us via info@bodhiyoga.es and we will ask you fill out the application form. Should any participant withdraw from our trainings before the end of the event, any refund of course fees is at the discretion of the Bodhiyoga course facilitators. In principle payments to Bodhiyoga are completely non-returnable under any circumstances and only transferable to trainings the following year. All such requests should be made in writing and sent to Bodhiyoga. Sadhita and Sudaka's comprehensive training course solidified my confidence in teaching Dharmic yoga. Their seamless weaving of yoga asana and mindfulness practice allow me access a depth of integrity when communicating the Buddha's teaching. I am grateful tothem for doing this pioneering work and enabling me to transmit the teachings of mindfulness and kindness through yoga. Andrea Campbell, Norwich, U.K.
A really inspiring course which explores remedial yoga, mindfulness, Buddhist principles and meditation in a perfect balance. It deepened my knowledge and understanding of yoga spiritually, personally and practically. Would highly recommend. Jo Newman, Birmingham, U.K.